What’s the most common muscle imbalance we see? Posted by Pinnacle Spine & Sports May 29, 2013 Comments Off on What’s the most common muscle imbalance we see? In other words, if you want a spine that is strong and stable and can withstand whatever postural challenges you’re going to throw at it from day to day, you don’t just need the physical strength of the muscles in your body, your brain needs to be able to accurately control it as well. You can read about this control aspect in our 3 part postural control blog posts on Proprioception, the Vestibular System and the Visual System, all of which create the necessary precise control of the muscular system. But the topic of this post is regarding the physical machinery that is required to create movement and stability of your spine throughout the day, or point 2 above: STRENGTH. 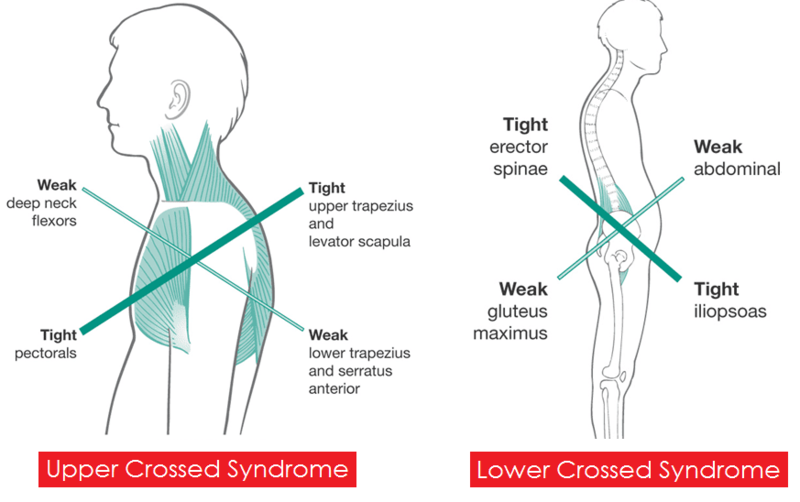 When we assess the strength of the muscular system in the body, we uncover a lot of different imbalances, but by far the most common ones we see act in a distinct pattern; a pattern we call the Upper Crossed and Lower Crossed Syndrome. First described by renowned Czech physiotherapist Vladimir Janda, these syndromes are characterised by alternating sets of muscle inhibition (weakness) and facilitation (tightness). In the case of Upper Crossed Syndrome, the deep neck flexors and the lower trapezius muscles become weak, while the upper trapezius, levator scapula and pectorals become tight. These people will be more likely to develop postural distortions such as forward head carriage, generalised neck/shoulder tension, and have a higher risk of getting tension-type headaches among other symptoms. Lower Crossed Syndrome is characterised by weakness in the abdominals and the gluteals, with excessive tension in the erector spinae (lower back muscles) and the iliopsoas (one of the hip flexors). These people will be more likely to develop an increased curve in the lower back when viewed from the side, lower back pain & stiffness, as well as potential hip and knee issues. A careful examination will determine if you have upper or lower crossed syndrome, and a tailored plan can then be developed to correct the problem. Specific strengthening exercises for the weak muscle groups and stretching exercises (sometimes including remedial or deep tissue massage) for the tight muscle groups will help immensely. Often these are done in conjunction with chiropractic treatment to help integrate the 2 essential elements of stability – strength AND control. Our exercise physiologist Karen Evans is the best suited to carry out this check, along with checking for any other functional imbalances or weaknesses that may be occurring. Do you suffer lower back or neck pain and stiffness, shoulder tension, headaches, recurrent hamstring injuries, or hip and knee problems? Chances are you have some or all of the features of these common muscle imbalances, and a solution might be easier than you think.